Qatar, the host of the 2022 World Cup, has gone to great lengths to assure the international community labor conditions are improving for workers. But on the ground, foreign laborers told Asia Times they are still working on tourist visas, unable to benefit from landmark labor reforms – or unaware of the changes. Turning onto the road to Mesaieed, an industrial area south of the Qatari capital Doha, the road immediately changes, from a smooth, soundless drive, to the crunching of gravel. The eyes take a few seconds to adjust to the darkness, except for the flash of a face staring at the screen of his phone or the glow from a tip of a cigarette as a man or two stands outside box-like buildings. Grayish-blue work clothes hang in the open area of the entrances of these structures. A figure steps outside and flings a garment on the clothesline. 'I was told before coming to Doha that after the two-year contract will be completed, I will be able to visit family in Bangladesh. And if I didn't want to go, I would be given that money,' said Muhammad, a Bangladeshi worker who came to Qatar in 2013 and is housed in one of the residential buildings in the industrial area. Muhammad says he is owed compensation for two return tickets but has received no money as yet. He says other workers in his industrial unit have faced the same issue. 'I didn't visit home this year. I received no money for my ticket. My passport is with my contractor. I can't leave without his approval,' he said. The International Labor Organization on Tuesday hailed new legislation passed in Qatar which will allow most migrant workers to leave the country without securing exit visas. 'This first step towards full suppression of exit permits is a clear sign of commitment by the Government of Qatar to labor reforms,' said Houton Homayounpour, who heads the ILO Project Office in Qatar. 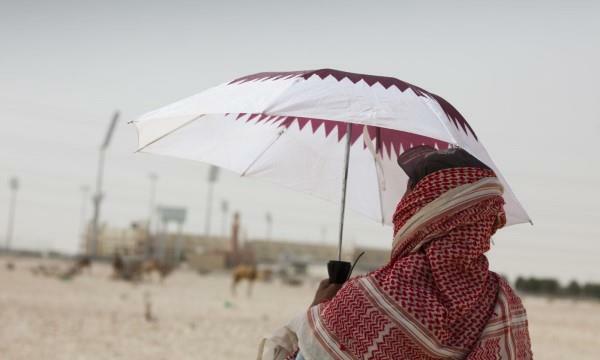 Doha, after coming under fire from rights groups and the international community over workers' rights, in May ratified two human rights treaties: the International Covenant on Civil and Political Rights and the International Covenant on Economic, Social and Cultural Rights. These treaties oblige Qatar to ensure workers have the right to freely choose their work, fair wages and safe working conditions. Those obligations apply to citizens as well as the migrant workers who make up at least three-fifths of Qatar's 2.5 million population. The two covenants go hand in hand with a technical cooperation agreement Qatar made with the ILO in October 2017. Doha agreed to set a minimum wage and abolish the kafala, a sponsorship system prevalent across the Gulf and Middle East that binds laborers to their employers and prevents them from leaving the country or changing jobs. The Qatari government also vowed to promote the voices of its workforce by creating joint committees in which workers would have their own representation. The labor ministry further launched an electronic notification system through which workers can request an exit from the country from the government, rather than depending on their employer. The worker can register on the website and use his or her employment information, such as occupation and company, and the ministry will have the final say in the decision. In instances of labor rights violations, the ministry would grant the approval to exit. The ILO, in recognition of these landmark steps, dropped a 2014 case against Qatar on alleged mistreatment of migrant workers on the site of one of the future World Cup stadiums. But on the ground, many workers say they have yet to see the benefits. Al Wakrah, south of the capital Doha, is the site of one of the eight stadiums under construction. Here, laborers say they are working illegally on tourist visas on a myriad of construction projects. 'I came to Qatar with a two-year contract on a visit (tourist) visa. Every six months, my visa is renewed by my company,' said Pradeep, who has been in Qatar for the past two years. While he is not seeking to leave the country, he is aware that he is excluded from workers' benefits, and at constant risk of confrontation with the law. The workers interviewed said their company stopped issuing identification cards in 2013. Without an ID card, a worker cannot benefit from the electronic notification system for transferring companies and cannot receive health insurance. They are also in a precarious situation as unregistered foreigners. According to the laborers, the police do not scrutinize the kind of ID shown to them, or whether they are on a tourist visa or work visa. 'If police stop us to see our documents, we show them our visa permit and they let us go,' said another worker, Ravi. Those interviewed said their companies do not provide medical insurance or gratuity agreements. They did not reveal their company names for fear of repercussions. 'It is very difficult to deal with these cases because we are not here (in Qatar) to police the labor market,' said Homayounpour of ILO Qatar. 'If a worker comes to the country on tourist visa and stays back to work, there is not much we can do. It is not our understanding that it is the employers who are making them work on tourist's visas,' he told Asia Times. Sharron Burrow, the General Secretary of International Trade Union Confederation (ITUC), believes the new reforms are meant to ensure that IDs are issued by the State of Qatar. 'Workers will no longer rely on their employer to provide their ID card,' Burrow said. Without an ID card, workers can easily be denied medical treatment, so to avoid such violations, a worker will be directly linked with the government. Workers interviewed, however, were not aware of the changes in the law. They said they were working illegally under tourist visas and had no direct link with the government of Qatar. The Qatari labor ministry could not immediately be reached for comment. 'Most of these workers have no idea what these recent agreements have been about and what rights have been given to them,' said a Qatar-based social worker, who wished to remain anonymous to avoid any limelight from authorities. Five years ago when Muhammad landed with a group of 20 other Bangladeshi men, he had already spent about 10,000 Qatari riyals ($2,700) on recruitment fees to an agent. His father had sold his land and the rest he borrowed from a bank. Three years later, when Muhammad's colleague Mubarak decided to leave Bangladesh for the promise of work in Qatar, he paid 15,000 Qatari riyals ($4,000) to an agent. A 2017 study by NYU Stern Center for Human Business and Human Rights estimates that Bangladeshi migrant workers in Qatar pay an average $2,890 for their recruitment. While many Gulf states, including Qatar, ban recruiters and employers from charging workers recruitment fees, 'the sale of demand letters is viewed by GCC authorities as mostly taking place either in sending countries or by migrants themselves in the GCC, rather than by their own citizens. 'Enforcement efforts, when they do occur, almost always target migrants,' said the report. While the ILO's policy states no worker should be charged recruitment fees, it remains unclear as to how Qatar aims to put an end to arriving workers being brought in through illegal recruitment practices. 'Everyone has a responsibility to do due diligence when it comes to fair recruitment, be it the countries of origin of workers or Qatar as a destination country,' said Homayounpour of ILO Qatar. Work is underway, he said, to eliminate this practice and ensure fair recruitment in the future. 'The supreme committee in charge of the structural projects for World Cup 2022 has started reimbursing the recruitment fee to their contractual workers,' he said. Sharan Burrow of the ITUC says there is a clear three-year timetable for Qatar to implement the new labor laws. As such, there is little evidence yet on the ground. 'The conditions which have prevailed to date have enabled scurrilous employers to exploit workers through dangerous hours of work, unpaid wages, contract substitution and other violations of ILO core labor standards and occupational health and safety norms,' Burrow said. 'The agreement between the ILO and government of Qatar will be judged by whether concrete steps are adopted that tackle core issues like recruitment fees,' said David Segall, a research scholar at the NYU Stern Center for Business and Human Rights. 'It, however, demonstrates the government's willingness to address some of the challenges workers face in Qatar.' he said. The ILO project office in Qatar says it is firmly committed to safeguarding worker's rights as per the 2017 agreement with the Qatari government. While implementation of labor laws may be in progress, the run-up to the 2022 World Cup will show how far Qatar has gone to fulfill its human rights commitments made through the ILO cooperation and UN conventions. Both the International Covenant on Civil and Political Rights and the International Covenant on Economic, Social and Cultural Rights guarantee the right to free movement and choice of work and an end to the kafala system in Qatar. If fully implemented, these agreements will put the Gulf state at the vanguard of safeguarding human rights in the region. If not, all eyes will be on Qatar for having the honor of hosting one of the most popular world events at a cost of moral and ethical violations that would have occurred in those same stadiums.